Egg tarts had always been on my to-bake list. I had some leftover tart dough from a previous bake and decided to attempt this 10 minutes custard. After reading Shirley’s post on her Hong Kong Style Egg Tarts, a strong sense of NOSTALGIA fell upon me. It’s true! Nostalgia just makes anything taste infinitely better. This is why most people love Mummys’ cooking best. Whatever you grow up with will always be your comfort food. 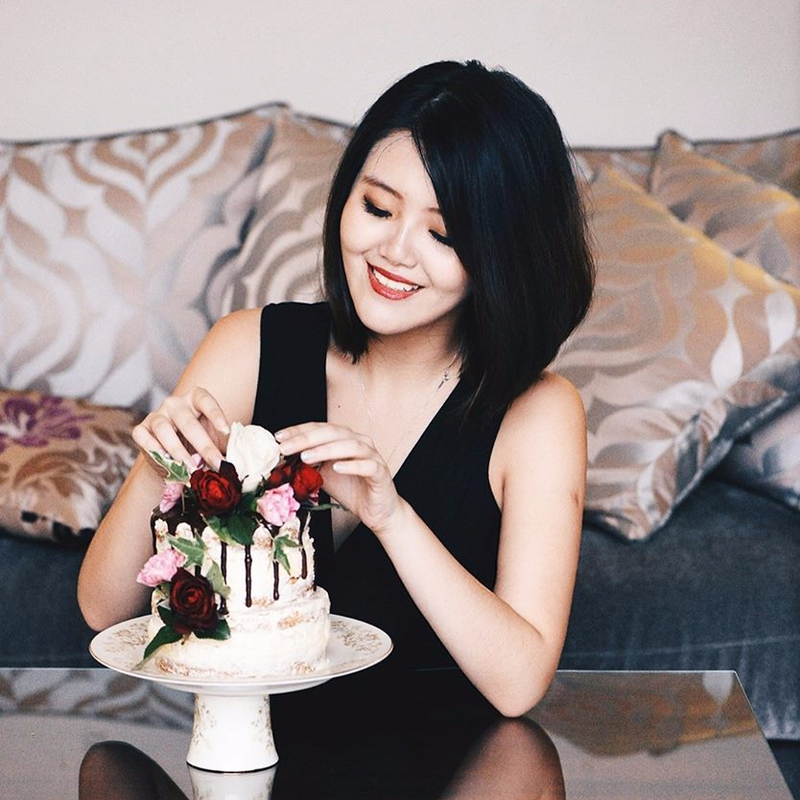 She followed a recipe that supposedly takes after Saint Honore Cake Shop’s famous oval-shaped egg tarts. As a little girl, I remember often calling my mum at work and requesting for a box of egg tarts, since her office was conveniently located by the mall (Parkway Parade for any Singaporeans reading this. They used to have it in the basement). The box of egg tarts was secured with a ribbon which I could never (for the love of God) figure out how it was tied on. Armed with a scissor, I would then snip the ribbon and open the box to reveal these yellow treats. My face would beam with glee. It was almost like a little leprechaun had just discovered her pot of gold. Cream softened butter with sugar until white and creamy. Add beaten egg white and mix until well incorporated. Slowly add in flour until the dough comes together. Do not over beat or you will end up with a tough dough. Chill the dough in the fridge for an hour before dividing the dough into 15 portions. Press the dough into a tart mold and press well to line the tart mould. Chill the lined tart molds for 15 mins. In the mean time, prepare custard. Prepare custard. Beat the eggs together and mix all the other ingredients in. Your custard should be very watery. You could then sift your custard once, just to get rid of any large chunks of egg yolk. Pour custard mixture into tart casings. Bake at 450 degrees for about 12 minutes or until custard sets. This should be done on the middle rack! 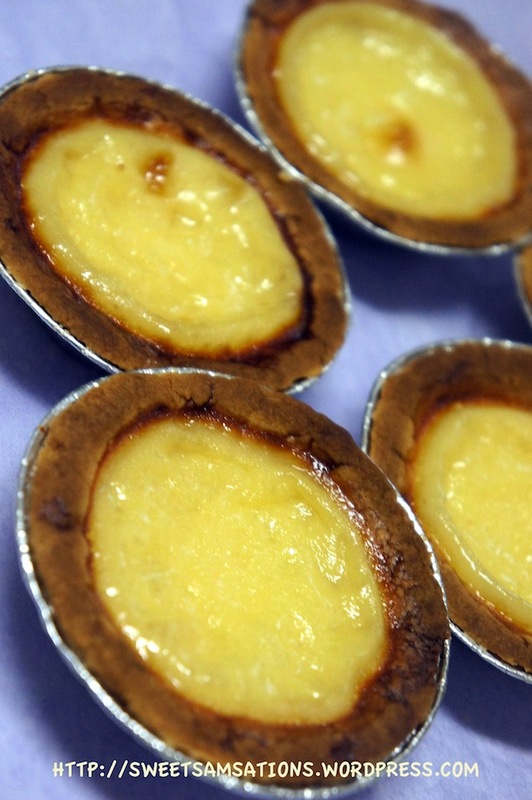 Let your egg tarts cool once the custard has been thoroughly baked and set. These tarts don’t taste as great when they are fresh from the oven. Once cooled, the tarts become sweeter and softer, without too much egg-y taste! Happy White Day to everyone! These are so cute. They look absolutely delicious!!! Now I’m craving for egg tarts T_T looking yummy and preety them tarts. Love love!!! hehe.. Thank you sayang!! I’ll make them for you next time!! ❤ ❤ too!! 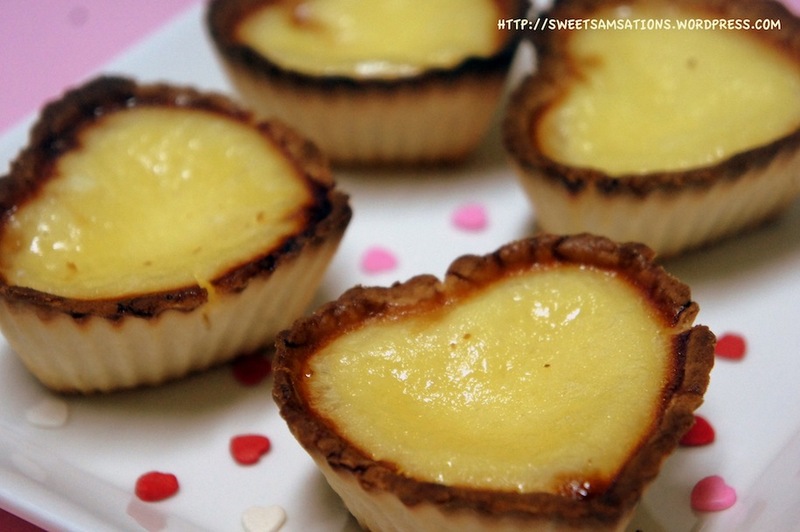 Sammie, heart-shaped baked goods are great anytime ;-)…and I love this egg tart custard ones…I always order when in Dim Sum, but never made it from scratch…bookmarked so I can try them. yeah! be sure to try them! These ones are really simple to make! The ones in dim sum are sometimes made with the extra flaky tart base! Those might take a while longer to make! (future blog posts? lol) Thanks for your sweet comment! I hope you have a great week too!! Sam..I buy boxes of these once every few months from a local asian bakery..I once came close to eating half a dozen! I’m so glad (and worried) that you posted a recipe for them, because now I know I’m going to be making them soon. The heart shaped ones are so cute! Wow, these tarts look so delicious. I can totally see these at a party or an event. You have definitely done a wonderful job. Awww! Thanks Kay!! I guess they would be quite ideal for parties / events! Very manageable finger food!! I just love these! They are so cute and sound very delicious! I love your childhood memories too. It is so good to have these kind of memories. Now I am going back to read about your White Day. Thanks for sharing! Thank you! I’m very honoured! These little tarts are adorable! What a cute mold. You should definitely use them for V-day, white day, and any other day too! These look absolutely lovely! They have a very classic look to them. I love egg tarts, that version is cute! One should never need an excuse to make or eat heat shaped treats. These are lovely. Thanks!! hahaha.. yeah. 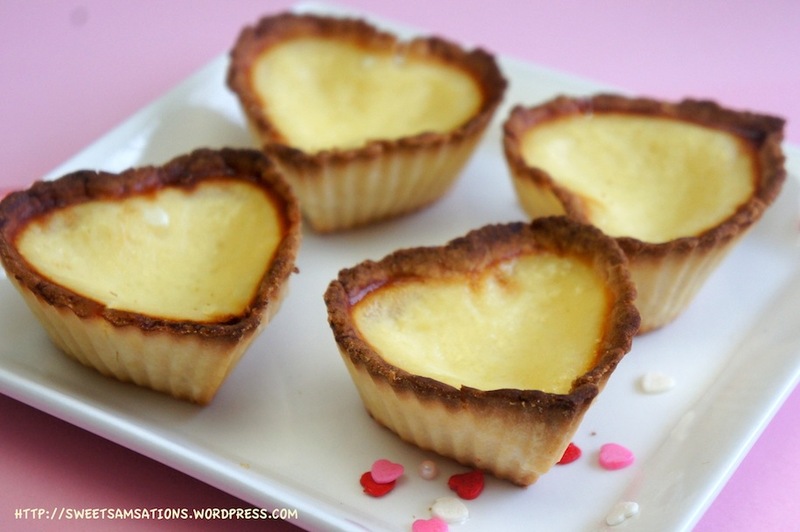 <3-shaped egg tarts are quite uncommon indeed! 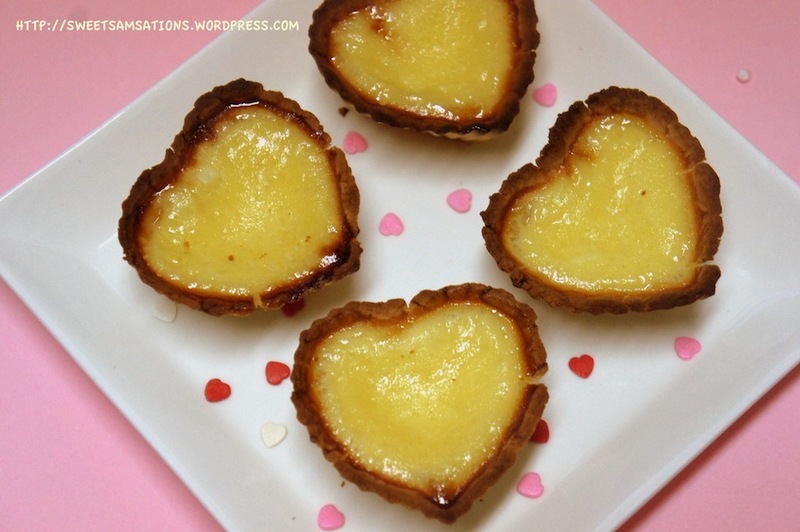 what cute heart shaped egg tarts!! 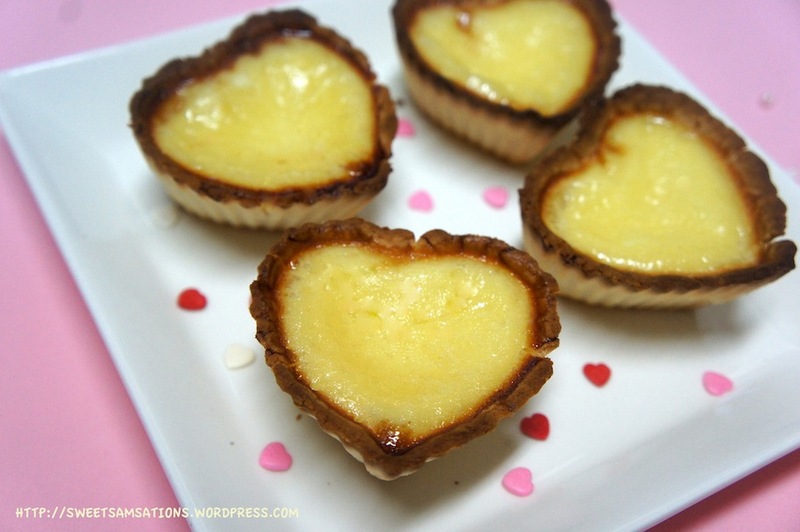 I LOOOOOVE your heart-shape egg tarts! OMG, they are the cutest egg tarts ever. 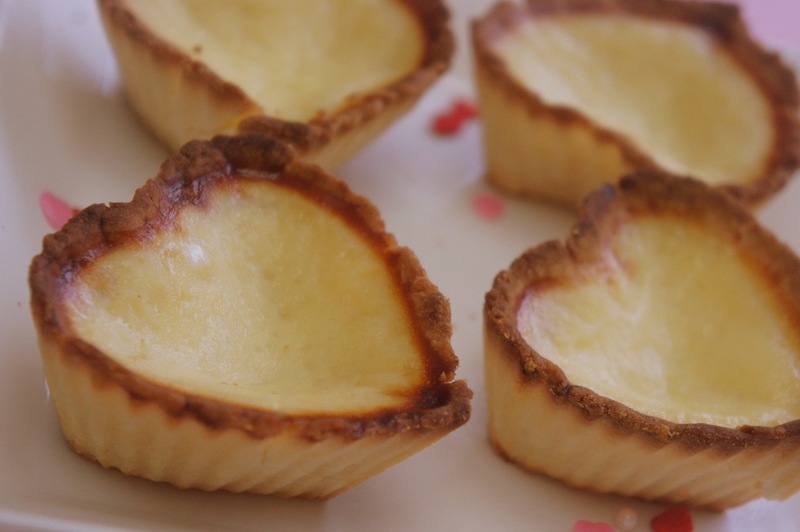 That’s right – boys need to make these delicious egg tarts to return the favor to the girls on the 14th! 😉 I would love to receive this rather than boring candies! hahaha! Thanks Nami!! Yeah, that would be something new for White Day!